Above: Tram 213 pictured in 2015. Above: Tram route 1's Infante starting-point (2010). Oporto's tram system has undergone a revival in recent years, having at one stage virtually ceased operations completely. From a rump service which ran for tourists from Infante to the Massarelos depot about a mile away, the system has been enlarged and now comprises three routes, as detailed below. The Andante Tour tickets do not entitle use of the trams. A separate ticket has to be bought on the trams at 2.50 euros. 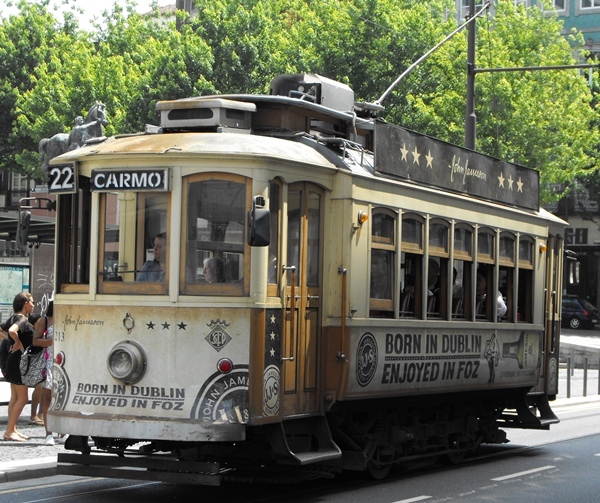 Alternatively, for 4 euros you can have a single tram journey and a visit to the Massarelos tram museum included. On the 22 these tickets are valid for the entire circuit i.e. not just from Carmo to Batlha or vice versa. Magnetic track brake equipment has been fitted to the operating fleet to ensure there are no runaways on the extended network which has steep inclines on routes 18 and 22. Traffic is growing and to cope, the remaining stored bogie cars are all being overhauled and returned to service. These include a number of "carros belgas". I am grateful to Ernst Kers and Mike Russell for some of the information noted below. The no.1 service has been inexistence for decades apart from 1994-99. In 1999 it was revived as route 1E running only from Infante, along the river front, to the Massarelos tram museum and depot, about a mile to the west. From December 2005, the route was extended to Passeio Alegre (Foz) and initially this was split into two sections; route 1 barré (i.e. the figure 1 with a line through it) ran along the river-front from Passeio Alegre (Cantareira) eastwards to Massarelos, from where Route 1E (proper) completed the line to Infante. From 1 January 2007, routes 1E and 1 barré have been combined a route 1, running the entire length from Passeio Alegre to Infante. The westwards portion from Massarelos to Passeio Alegre (Foz) was reopened in March 2002 having previously been a closed section of the old tram route 1, which had operated all the way to Matosinhos (Mercado) from Infante. Matosinhos is now served by a totally different route on the Metro system from Trindade. The eastwards journey from Massarelos to Infante (route 1) takes about 10 minutes and runs in front of the Museum of Transport and the Museu do Vinho do Porto, the former at Alfândega, the latter a few hundred yards further towards Massarelos. The track is now largely single, with a passing loop at Alfândega. Service frequency in 2011 is half-hourly. At the Passeio Alegre, the route just peters out incongruously at the road side. Opposite is the estuary and coast, and a pleasant park. Right: Tram 1 at its Passeio Alegre terminus, 2011. From September 1994 this route, from Carmo to Boavista, was the only operational tram line in the city. In 1998 the route ran for a period solely between Boavista and Foz before being reinstated to Carmo later that year, when it also had a branch running to Infante along the former route 1, albeit on newly laid single track. From May 1999 the Massarelos to Infante section was renumbered as 1E and in July 1999, route 18 was closed for road works. It reopened in February, 2001 running just from Massarelos up the hilly Rua da Restauração to Viriato. From 17 December 2005, the 18 has been extended to run from Massarelos via Viriato (Rua da Restauração) to Carmo. For some years it terminated at Viriato but returned to its historic terminus, a little further towards the city centre, at Carmo. The journey, mostly on single reserved track at the top end, affords good views across the river to the right and up to the Palácio de Cristal gardens to the left. Service frequency is half-hourly. At Carmo it stops adjacent to route 22 (see below) for easy interchange. In September 2007, after a gap of 30 years, trams returned to Oporto city centre as the newly contrived route 22. This development was possible after the local council had re-laid and re-opened the line from Carmo to Praça (da Liberdade) in the heart of the city and, from there, up the hill to Batalha to a terminal stub adjacent to the restored Guindais funicular. However, despite having to reverse at Batalha/Guindais, the new route 22 effectively operates as a circular, linking Carmo to Batalha every 30 minutes. The route passes from Batalha via Santa Catarina, Passos Manuel, Pç D. João I, across the Avenida dos Aliados to D. Filipa de Lencastre, then the Ruas Ceuta, José Falcão, Guilherme Gomes Fernandes and Gomes Teixeira squares, Cordoaria, Clérigos and Rua 31 de Janeiro. Almost 5,000 passengers used the new tram route no.22 in its first week of operation, which was from 23 to 29 September 2007. At Carmo the 22 intersects with the 18 route, which in turn links to route 1E at Massarelos, so it is possible to use all three routes very easily. Left: In a photo kindly provided by Tim Fenton in October 2005, the service 22 (tram 143) is seen in front of the Carmo monastery in central Oporto. Behind it is the other extreme of Oporto's transport, a gas-powered bus. 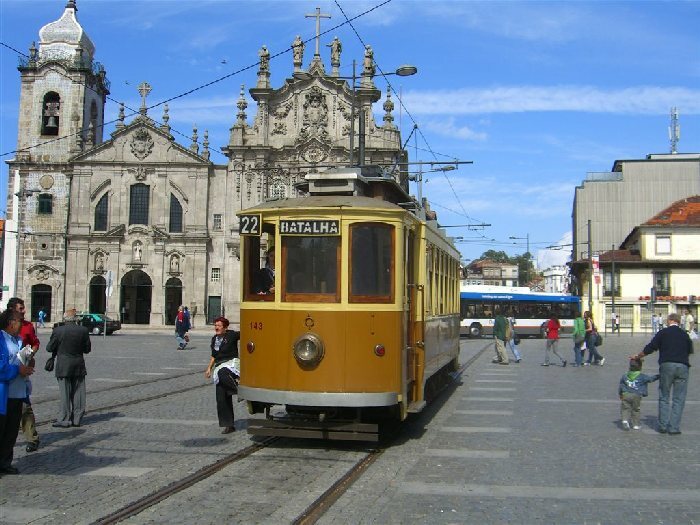 Between September 2009 and June 2011, a City Tour tramline, "T", also operated, running from Infante via Massarelos, Cordoaria, Batalha, Carmo, Massarelos and back to Infante. It was withdrawn due to poor patronage, a consequence of its relatively high fare.